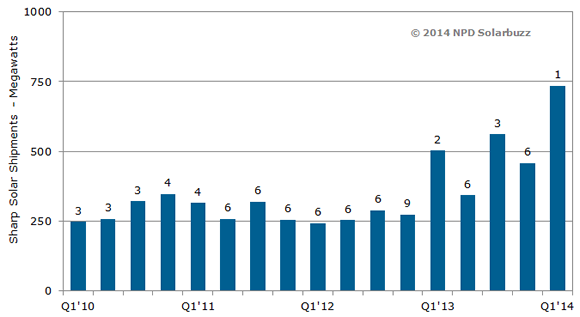 NPD Solarbuzz ranks Japan based Sharp Solar as number one solar photovoltaic (PV) module vendor in 1st quarter of 2014. Sharp said to have overtaken First Solar and Chinese-based solar PV suppliers. During its previous reign as the industry’s leading PV module supplier, Sharp pursued a vertically integrated strategy, manufacturing its own solar cells and modules. However, during the past few years, Sharp has shifted its emphasis to selling modules manufactured by outsourced partners located mainly in China and Taiwan.